Draperies Provide a Custom Look to Any Room. Palm Beach Fabrics offers a wide variety of the highest quality drapery fabric for your home. With the right choice of colors and design you can enhance any room in your home or office. We can assist you in choosing the style of draperies and other window treatments to achieve the look you desire. 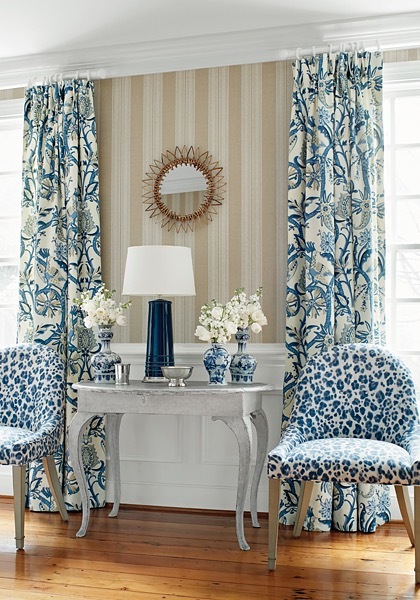 Adding draperies changes the entire look and feel of a room. Even stationary side panels, cornices or valances will give a room a “finished” look while adding color and texture to it. Draperies and other soft window treatments make your house feel like a home. Working draperies give you the option of enjoying your view during the day and having privacy in the evening. And while they are providing an important function they add style too. UV rays cause your upholstery and flooring to fade or change color over time. Installing draperies as soon as possible after moving in will help prevent this fading from occurring. Working draperies, especially blackout-lined draperies, help eliminate the escape of energy and insulate your home keeping things cool in the summer and warm in the winter. Whether it’s your TV or computer screen, draperies can prevent annoying glare. They also can prevent early morning sun from awakening those who would rather sleep in then be up at the crack of dawn!